2017 NSHRF Scotia Scholars Awards recipients include, front row from left, Carmen Landry, Elizabeth Wallace, and Laura Davidson. Back row: Devin Wood, Hannah Stevens, and Molly Rutherford. Missing from the photo are Emma Truffyn and Jessica Delorey. 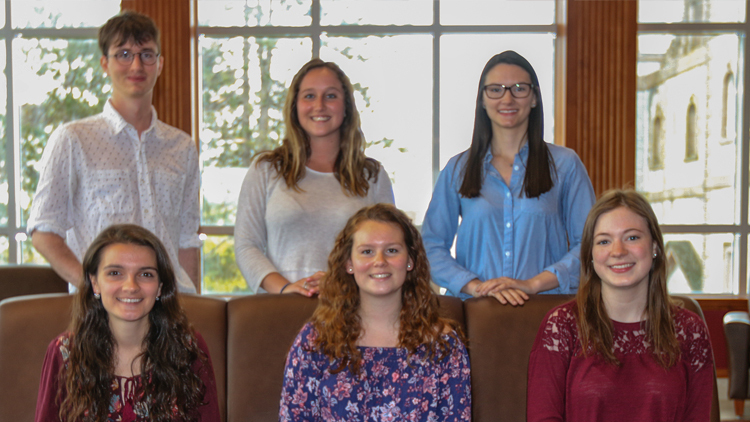 The Nova Scotia Health Research Foundation (NSHRF) provides support for undergraduate Scotia Scholar research awards valued at $5000 each. Applications must fit with one of the two priority NSHRF areas (1. biomedical research or 2. health policy, health outcomes and health services research). Each student applicant must apply together with a StFX faculty supervisor. Student applicants must demonstrate in their application that the research activity they will complete as part of their degree requirements relates to health research and is relevant to the mandate of the NSHRF and the NSHRF’s health research priority areas. Applicants must also be registered in a honours stream or advanced major undergraduate degree program and have completed at least two (2) years of an undergraduate degree; have achieved a first-class average in the current undergraduate degree program; and be in good standing for continued enrollment in a honours stream or advanced major undergraduate degree program. An annual call for applications is made each year by the Office of the Asscoiate Vice President, Research and Graduate Studies.